Continuing from my previous SSAS post on : MSBI # 8– SSAS # 2- Get familiar with BIDS–SSAS ? – (SQL Server Analysis Services). In this Post , we will develop an Analysis Services solution using the Business Intelligence Development Studio, an environment based on the Microsoft Development Environment shell. 1.SQL Server 2005, Analysis Services provides a unified and integrated view of all your business data as the foundation for all of your traditional reporting, online analytical processing (OLAP) analysis, Key Performance Indicator (KPI) scorecards and data mining. 2. Provides business semantic model, referred to as a Unified Dimensional Model (UDM) that defines business entities, business logic, calculations, and metrics. The UDM is a central place that serves as the single version of truth for all reports, spreadsheets, OLAP browsers, KPIs, and analytical applications. 3. Maintains a highly compressed and optimized Data Cache called Proactive Caching that is maintained automatically as the data in the underlying source databases changes. The cache provides superb query performance and isolates back-end source systems from the load of the analytical queries. 4. XML for Analysis (XML/A) is the native, standards-based protocol for communication with the Analysis Services server. Applications that integrate analytics with operations in real time that can access the data from any platform and any language. 5. The Key Performance Indicator (KPI) framework provides a rich centralized repository defining key metrics and scorecards. The KPI framework in Analysis Services lets you easily build balanced scorecards and other types of business performance management applications. 6. Translations provide a simple and centrally managed mechanism for storing and presenting analytic data to users in their preferred languages. 7. Multidimensional Expression (MDX) Scripts are the new mechanism for defining calculated members, named sets, and cell calculations. 8. Semi-Additive Measures is a new measure aggregation type for advance data modeling includes last-nonempty, last-child, first-child, average-of-children, and even by-account-type. 9. 2005 Analysis Services (SSAS) provides tools for Data Mining with which you can identify rules and patterns in your data, so that you can determine why things happen and predict what will happen in the future – giving you powerful insight that will help your company make better business decisions. We will create Analysis Services projects in Business Intelligence Development Studio by using the Analysis Services Projects template. The Analysis Services project helps you organize and manage the items that are required to build, debug and deploy an Analysis Services database. 1. Click Start | All Programs | Microsoft SQL Server 2008/Microsoft SQL Server Denali CTP 3 | Business Intelligence Development Studio. 2. Click File | New | Project. 3. In the New Project dialog box, in the Project Types pane, click the Business Intelligence Projects folder. 4. 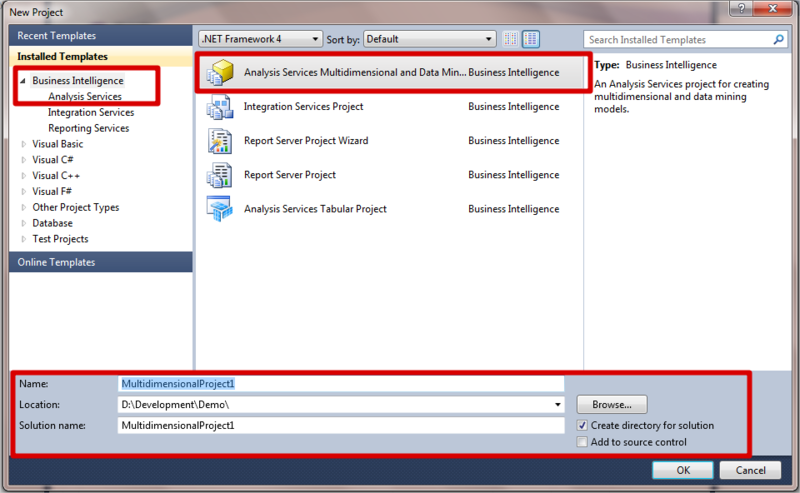 In the Templates pane, click the Analysis Services Project icon. 5. In the Name text box, type AS Exercise 1. 7. Uncheck the Create directory for Solution checkbox. The New Project dialog box should now look like Figure 1. 8. In the New Project dialog box, click OK.
An Analysis Services Project is a group of related files containing the XML code for all of the objects in an Analysis Services database, and your next task is to create a Data Source. We will have some more post based on Hit Start for SSAS Development in upcoming post. One of the great thing about this post is location where I am giving this post is nothing but .net blogger Ganesh very sweet and cool village. Previous Post Moving Ahead with Mobile Business Intelligence–Data Everywhere ! !